Above are two photographs of Laurence McGinley (1905-1992), the important early figure in the history of Fordham University in America. The left hand photograph shows him in a digger machine 'turning the soil' on a new developement on the Campus at Fordham, to be called the Lincoln Center Campus. The second photograph shows the ever popular Laurence standing outside the entrance way of Fordham University. Both photographs are shown with the kind permission of Fordham University. The above image is very rare now. It shows the front cover of an important piece of work by P.T. 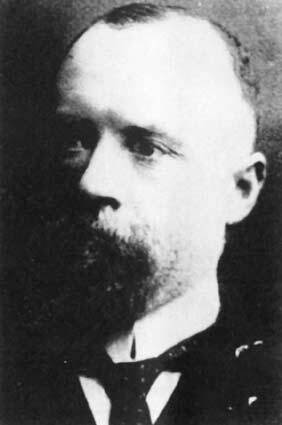 McGinley (1856-1942), or by his 'pen name' of Cú Uladh. The work was entitled 'Eachtra Aodha Ruaidh Dhomhnaill' dating from 1911. It was about the life of the great Aodh Ruadh/Red Hugh O'Donnell. The artwork on the cover is reputedly by Cú Uladh himself. Cú Uladh was responsible for many other important written works in the Irish language. 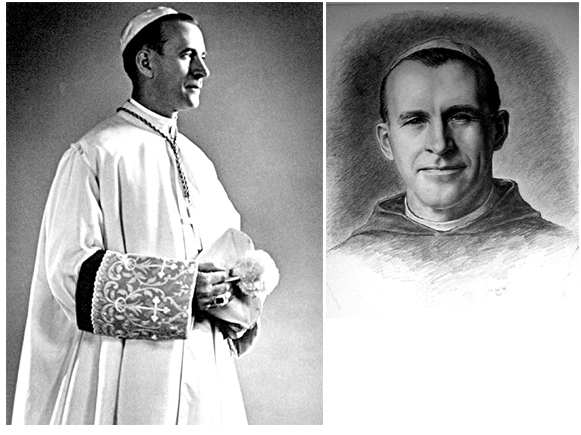 Here are two great images of the celebrated Brother Gerard McGinley (1906-1955). He was a noted religious figure in the state of New York in the early part of the twentieth century. He was responsible for setting up his own monastery which still runs today. The left hand photograph is an official monastery photograph, while the right hand image is a more relaxed pencil sketch. Both date from around the same period in the 1940's and have been kindly given to us by his monastery. 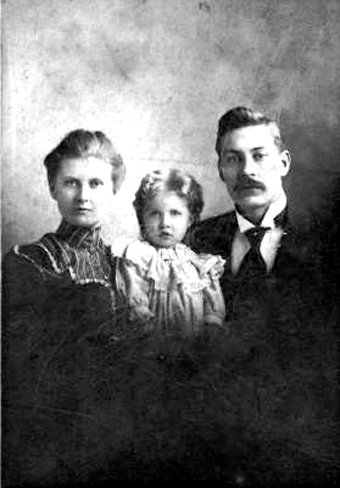 Robert J McGinley (born 1873) & Essie Glendenning McGinley with their daughter Hazel. Robert was a descendant of the early Monroeville Pennsylvania McGinleys, being a grandson of the first McGinley in the area. They were a notable family in the area. The photograph on the left represents the house of the Monroeville McGinleys. It is probably the oldest 'stone field' house in the area. It is now a local museum and is called McGinley House and can be found on McGinley Road in Monroeville. The early McGinleys were largely responsible for the first developements around Monroeville. On the right is The Old Stone Church, where the Monroeville McGinleys went to worship. The above image comes from the very important manuscript An Cathach or in English, The Battler. It was an essential relic/symbol for all of the Donegal clans, especially those descended from St Colm Cille. The manuscript is the oldest found in Ireland and contains an important early version of the Psalms, said to be the second oldest in the world. An Cathach was the book that was carried into battle to protect the Donegal clans. The above shown page is one of the better conditioned ones. The photograph on the left shows Laurence Ginnell (centre) at Irelands famous Croke Park stadium before an important sporting event. At this point in time he was one of the most respected men of his generation in Ireland. The photo dates to around 1917. The photograph on the right is of James Joseph McGinley (1881-1959), son of an early McGinley settler in Australia, Rory McGinley. This is a photograph of an early McGinley family in the city of Philadelphia. 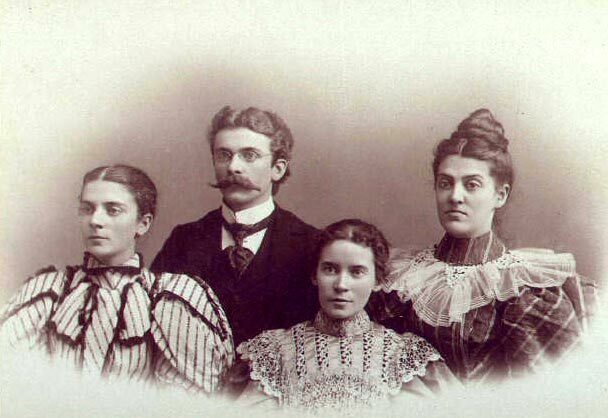 From left to right: Elizabeth Madora McGinley, Joseph Warren McGinley, Rebecca Emma McGinley and Olivia Caroline McGinley. This photograph dates to about 1890. Rebecca, the youngest here, went on to become a local politician in the Philadelphia area and she was known Rebecca Emma McGinley Sinnamon. In this photograph (which was taken circa 1940 in Philadelphia), we have Rebecca Emma McGinley Sinnamon (b 1873), second from the right. She was a noted local politician in Philadelphia in the 1920's for the Republican Party. 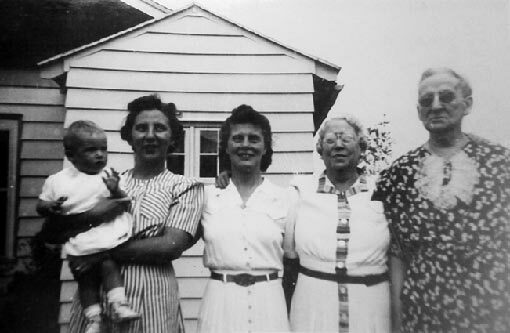 She is shown here with members of her family including, on the right, Olivia Caroline McGinley. The above images come from pages contained within the section of the Leabhar Chlainne Suibhne (Clan Sweeney Book) that was written by Ciothruadh Mag Fhionnghail around 1513 to 1514. The text is mostly in Irish Gaelic typical of the period, with some small amounts of Latin. Irish monks were well versed in the Latin language as well as their native Gaelic. This important Irish manuscript is housed in the Royal Irish Academy and is shown here with their kind permission. Here we have two photographs of Monsignor Roger A. McGinley (1870-1936), the celebrated figure connected to Jersey City in America. McGinley Square is named after him there. The photograph on the left was an official portrait. The one on the right shows him winning a cup for 'Best Dog'. He was a great dog lover and delighted in taking part in competitions. From Jersey City Observer, April 25th 1936, courtesy of Jersey City Free Public Library. 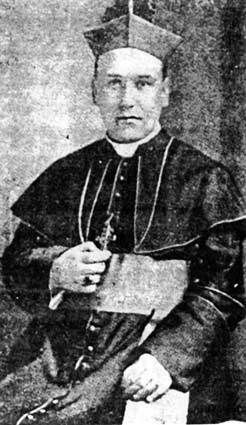 This photograph is of Bishop John B. McGinley (1871-1969), the well respected figure from Meenacross in south west Donegal, noted son of T.C. McGinley. This was a special portrait taken of him taken during his time in the Phillipines. Later he went on to greater fame as the Bishop of Fresno in California, USA. For a time, in his early years, he was curate at Our Lady of the Rosary Church in Philadelphia. He retired back in his native Donegal. The above is a reconstructed newspaper report highlighting the famous incident of December 28th 1922, when Laurence Ginnell stormed the Irish Free State Consulate offices in New York. With his comrades, he demanded that the offices belonged to the people of Ireland. With him was a member of the IRA as well as other Government figures. The incident sparked widespread condemnation in England. The Irish Consul Daniel J. McGrath denied the right of Laurence Ginnell to control the offices. Here we have two images of Jim McGinley (1878-1961), an early star in the world of Baseball. On the left is a photograph from 1905 when he played for the St Louis Cardinals (Photo credit: Chicago Daily News). On the right is a great image of him from an early American Baseball card (1904) shown here with the kind permission of SABR (Society for American Baseball Research). This is a great photograph of Jack R. McGinley (1920-2006), the Vice President of the American football team The Pittsburgh Steelers. He was a major shareholder with the Steelers for 60 years. Here he is in his office during his boxing promotion days with the Rooney - McGinley Boxing Club, when he was among the top in his field in the state of Pennsylvania. Laurence Ginnell (1854-1923). This photograph of Laurence, or 'Larry' as he was known to his family and friends dates to about 1895. This would be around the same time as he was forming the United Irish Land League along with his comrade William O'Brien. He was to have a very full and active life ahead of him! 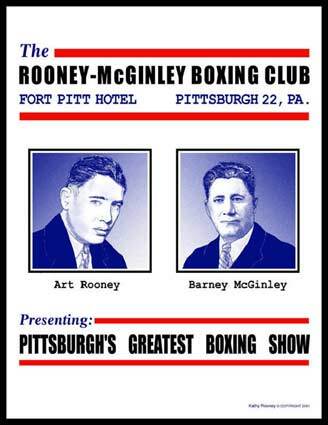 The above image is an advertisement (circa 1940's) for the noted boxing club owned by Art Rooney and Barney McGinley in Pittsburgh, Pennsylvania. They were very successful in the 1940's and 1950's. Both men also controlled the Pittsburgh Steelers American Football Club. Barney's son Jack R McGinley was attached to both businesses and was part of the Steelers for 60 years. 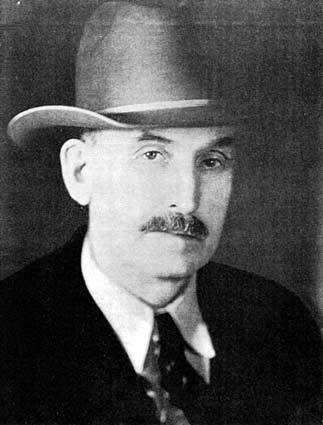 This photograph is of Sheriff Ed McGinley (born 1875), the respected lawman of Thomas County in the state of Kansas, USA. His reputation for catching criminals went all the way to Hollywood and is said to have caught the eye of Humphrey Bogart, who cited Sheriff Ed as an influence! The above images are of programmes and guides associated with the Pittsburgh Steelers American Football club. The McGinley family in Pittsburgh have had a major stake in the Steelers for generations. The image on the left is from a rare match day programme from 1947 at Forbes Field, Pittsburgh. Above is a photograph of the grave of the noted Lt. Col James McGinley of Tennessee. He was originally from Fairfield, Pennsylvania being a direct descendant of the first known McGinley in America. James fought alongside Washington at Yorktown during the American Revolutionary War. After the war he settled in Maryville Tennessee and was a teacher and prominent member of the Presbyterian community. His headstone is in the New Providence Church Cemetery, Maryville, Tennessee. Arthur or Art McGinley was an influential and well liked Sports Reporter from Connecticut. He was a close friend of the playright Eugene O'Neill who wrote a play/film about the McGinley family called, Ah, Wilderness!. Over the years he became friendly with most of the top sports personalities in America. The above photograph shows him talking with the legendary Joe Di Majjio. In 1916, during Irelands glorious Easter Rising, there flew a flag over the GPO (General Post Office), the central location of the fighting. This flag became the symbol of Irish resistance against the British. The flag was said to have been made from the bedclothing of Laurence Ginnell according to two seperate sources at the time. The flag was captured by the British after the Rising. Above is a photograph from the McGinley Cemetery in Tennessee where many early McGinley settlers in the state are buried. The image is of the grave of Joseph Rankin McGinley a son of the noted Lt. Col James McGinley. Like his father, Joseph Rankin was a great lover of horses. The above photograph is a partial view of McGinley Cemetery in Tennessee where many early McGinley settlers in the state are buried. These McGinleys descend from the first known McGinley in America, James McGinley of Fairfield in Pennsylvania. This is a very rare photograph of Patrick McGinley from Gola Island off the coast of Donegal. He was the hero of the 'Howth gun running'. The Easter Rising of 1916 would not have happened without these weapons that were secretly smuggled into Ireland. The weapons were stored in trunks at Pádraig Pearse's school, St Enda's in Dublin, and this was known by many members of the school. Patrick moved to America where he settled in Norridge, Illinois. On the left we have a photograph of Dr McGinley of Glenswilly and his wife taken in the mid 1960's in the garden of their home at Beechfield. On the right is a picture of Beechfield House in Letterkenny, Co Donegal. Billy Conn was a famous world boxing champion from Pennsylvania, he won the Light Heavyweight World Championship in 1939. Billy Conn was reckoned to be one of the best ever 'pound for pound' fighters in America. He was of Irish origin as was Art Rooney and Barney McGinley, the owners of the renowned Rooney McGinley Boxing Club of Pittsburgh. Billy trained at Rooney McGinley and was a familiar face there. 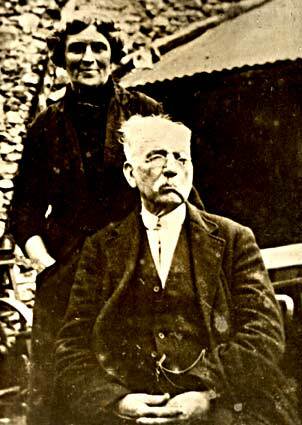 The above photograph shows Kathleen McNish and Barney McGinley. Barney was one half of the Rooney McGinley Boxing Club of Pittsburgh. Their heyday was in the 1940's and 1950's. 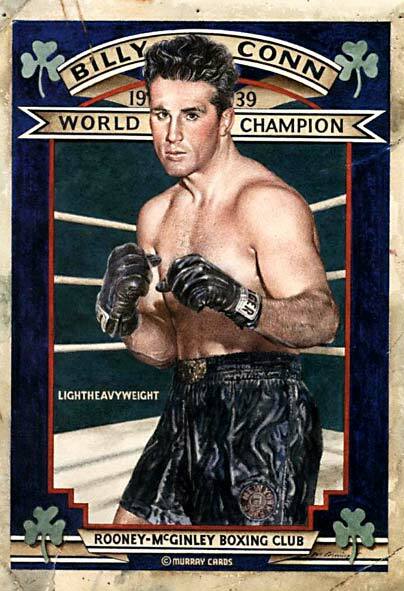 His son Jack R. McGinley helped out as promoter from 1946 until about 1953. Barney McGinley was the original part owner with Art Rooney of the Pittsburgh Steelers American Football Club. 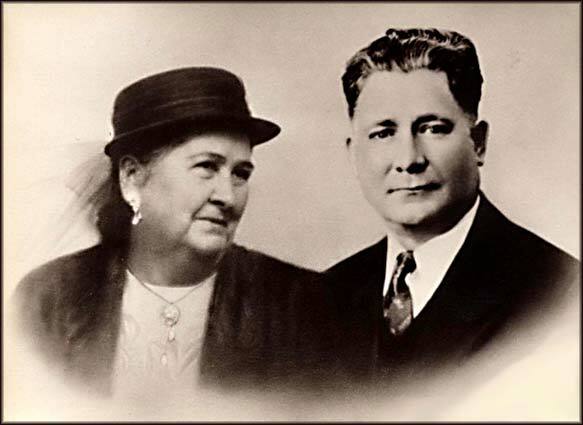 An excellent businessman, Barney and Art together owned the General Braddock Brewing Co during the Pre-Prohibition years in America. The grave of Owen McGinley at St Francis Cemetery, Pawtucket, Rhose Island, USA. 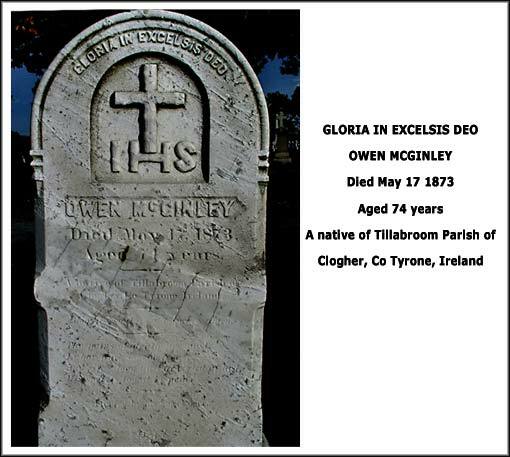 Owen was a native of Co Tyrone in Ireland and his grandfather was a John McGinley/McKinlay of Tyrone who was born about 1740. Owen was a self-made man and prominent businessman in Rhode Island. It is not known when he first went to America, but given his age, he probably arrived before the Great Hunger. 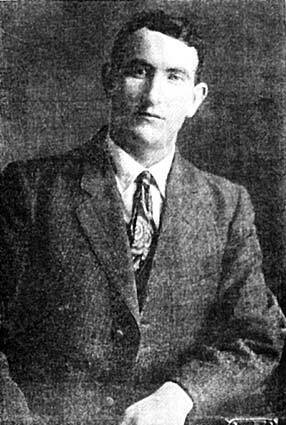 This photograph shows the noted Glenswilly man Michael McGinley, author of 'The Drumboe Martyrs' and 'The Hills of Glenswilly'. Also in the picture is his wife Bridget McDevitt from a neighbouring family. The photograph was taken sometime in the late 1920's outside their home. In the centre of the back row is the great Cú Uladh, or P.T. McGinley. Sitting just in front of him (slightly to his right is his wife Lizzie Woods of Bogagh, Raphoe). They are surrounded by their children. He had twelve children, ten being boys. 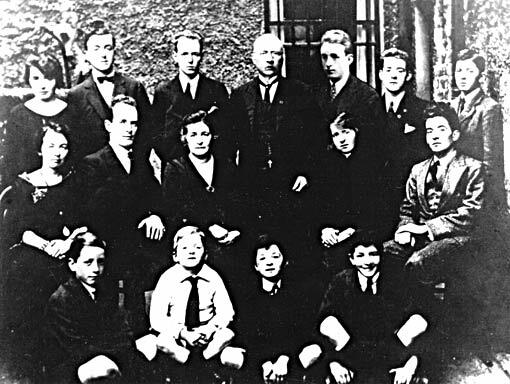 He sent all of his boys to the famed first official Gaelscoil (all Irish medium school) opened and run by Pádraig Pearse! This photograph is of Phyllis McGinley, the great Irish-American poet and writer. The photo was taken in her own garden around the late 1950's. 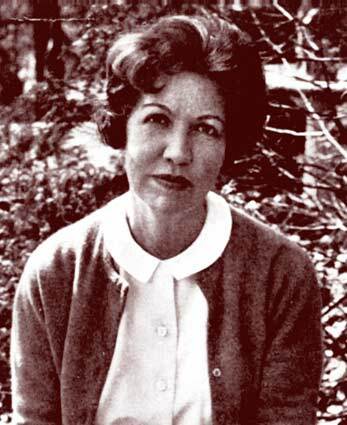 Phyllis won many awards for her work in her lifetime, most notably the Pulitzer Prize. She remains one of the best female poets of twentieth century America. Photo Credit: J.B. Lippincott Company. 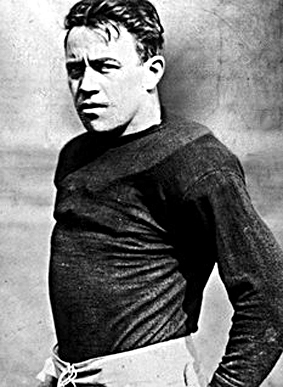 Ed McGinley was an early American football star. He was a talented offensive tackler. He played in the National League with the New York Giants in 1925, their first season as a professional team. He was elected to the College Football Hall of Fame in 1979. 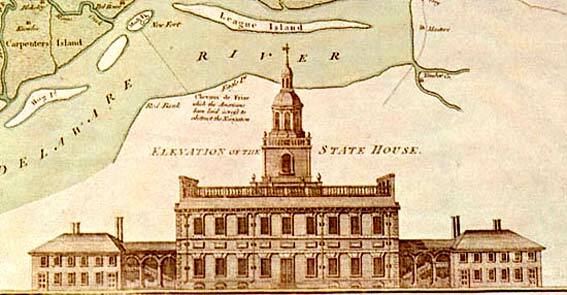 During the debates on American independance in 1777 and 1778, the talks were held at The State House in Philadelphia. Among those taking part in the Second Continental Congress was Capt. John McGinley. The Second Continental Congress of 1777 and 1778 made some important decisions. It was this group of 63 delegates (including Capt John McGinley) that approved the draft version of the American Constitution and also approved the official American Flag. The original, showing the first 13 colonies/states is shown above. This lovely old photograph shows Micheal McGinley and his wife Martha Lambert. 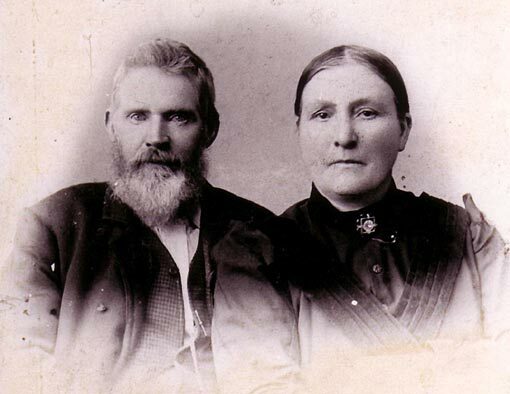 Michael was born in Ireland in 1833 and went to America as an orphan aged 11. He later became a Confederate soldier in Virginia. (see More McGinleys). 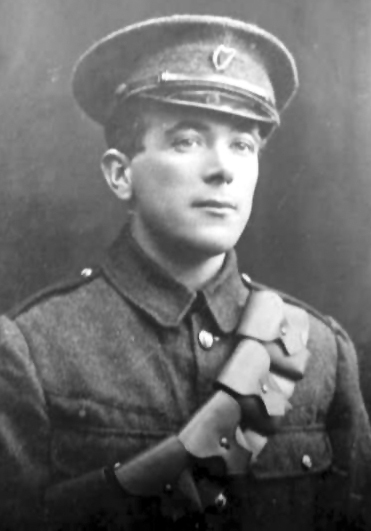 A photograph of Patrick McGinley, a war hero of the Easter Rising in 1916. Patrick, from Dublin, was in the GPO in Easter Week along with his brother Liam (William). Here he is pictured in his Irish Volunteers uniform.